Like many people who attend jazz concerts year round, this reviewer found out that the Edmonton International Jazz Festival's small and medium size stages are really the places where the music is at. Being from Hungary, I was fortunate enough to spend a year away from home in Edmonton. As a dedicated jazz journalist, I decided to go out and cover both the headliners and Canadian acts, taking a pass on some artists I had already seen. My greatest expectations, however, were on one specific concert from an artist I had already seen: Wayne Shorter. Yet another reason for me was to head out to the elegant Winspear Centre that same night was the opening act of Canadian-Hungarian pianist Robi Botos. After his arrival at age 20, he quickly established himself in Toronto's jazz club circuit, winning plenty of praise along the way, even some international competitions, like the one held three weeks ago at Montreal's jazz festival. With help from the local jazz community, he worked through the red tape with immigration authorities and now has full legal status to stay here with his family. I presume Botos does not make it to Western Canada too often and due to the very limited time he had, enough only for four tunes, he could not show his full hand. Bassist Mike Downes and drummer Morgan Childs, both Torontonians, were his sidemen, though they are not the pianist's regular bandmates. However, both the leader's warm, positive and powerful personality and the way he told stories with his originals like Place to place, A People Uncounted were very well received, the listeners easily relating to them. Botos is not one to deconstruct everything, preferring to stay within a mainstream approach as a means to express his deep and sincere feelings with sincerity and clarity. I trust he will be invited back to Edmonton, either to the festival or to the Yardbird Suite. The Wayne Shorter Quartet has provided many listeners with the ultimate concert experience, including yours truly. The legendary saxophonist and composer has been fronting his current band for 11 years now, with the same sideman as ever: Danilo Perez (pno), John Patittucci (b) and Brian Blade (drs). The leader's playing attitude is as much dictated by his quirky personality as a clearly post-modern approach: He tends to muse on his own pieces (being the colossal composer he is, that is quite unavoidable), commenting on them, offering contrasts, while restraining himself from offering a full blown narrative. The first 15 minutes of the concert unfolded like a game of hide and seek: No member of the quartet took the spotlight. This seemingly cautious approach may well be due to the fact that no one wished to overstate something too early on, or maybe there was another reason for this… Yet, when the music would build up to a peak, it would not burn for too long. A month short of his 79th birthday, Shorter made a fragile impression on stage, spinning out longer statements on soprano than on tenor. During some long stretches, when the music would gain momentum, Perez was the effective leader, holding together those loose fragments, as beautiful as they are. Shorter certainly is a laissez-faire bandleader, clearly a disciple of Miles Davis in that regard. Nevertheless the intensity I witnessed in earlier concerts was missing. The pianist, for his part, seemed to play much more out the Schönberg bag and other twentieth century classical composers than usual, his latin chops pretty well kept at bay. Knowing that Shorter is working on new compositions for symphony orchestra, I suspect this stylistic shift comes from him rather than the piano player. Shorter, righteously so, was never one to make compromises with the agonizing recording industry, so there are very few recordings of his quartet on the market, the last dating from 2005. Fortunately, he has just signed a new deal with his former label Blue Note, and is probably releasing some long overdue quartet recordings soon, hopefully not just the new symphonic material. At this time, only those really serious music fans may still be in touch. With only a handful of videos available on the web, it is tough to decipher the unique approach of the quartet. The reception of the concert demonstrated to me what happens when there is not enough information available to the audience. While the Edmonton festival goers appreciated what they heard, no question about that, they weren't exactly enthralled by it either. As a 17-year older, singer and pianist Eliane Elias once played in a bar in São Paolo with no less than Antonio Carlos Jobim and Vinicius Moraes in attendance. Impressed by what he heard, the latter hired her on the spot. Could one think of a more auspicious way to kickstart a career? A turning point for sure, but not the only one for her. Having moved to New York in the early eighties and being married first to Randy Brecker, now to Marc Johnson, she seems to have the Midas touch when it comes to rubbing shoulders with great musicians. During her concert at the EIJF it became clear very soon that her blend of jazz and Brazilian music works just fine. The line-up of the Elias quartet facilitates that special blend. Guitarist Rubens de La Corte gave the necessary backing to her singing the verses of songs by Jobim and the like, with smooth chords beneath, being given two nice solos along the way. With bassist Marc Johnson and drummer Rafael Barata in tow, Elias stuck to a classic jazz trio concept. Both compelling and pervasive as a performer, Elias can bring about a flux of magic on the keys thanks to her hard-swinging left hand and tightly woven chords. Her very appealing set was at its best when doing more contemporary Brazilian tunes that comprise the majority of her new album, most notably Rosa Morena (the only tune she sung away from her piano, dancing instead on center stage). Still she tackled some Gershwin and a couple of Jobim evergreens like Desafinado and Chega de Saudade, much to the audience's delight. Sax player Tommy Smith is as open about being Scottish as Elias is about being Brazilian; however, the ironic nature of Smith makes him put all of that in brackets right from the start. His quartet, Karma, has been hailed by critics as his most daring band in years, and that may well have to be true. Unfortunately for him, he lost his pianist on the long way to Western Canada, so a replacement had to be found: Local hero Chris Andrew stepped in and did an absolutely marvelous job with the material that was at once thoughtful, well-composed and far from easy to sightread. No wonder they only ventured to do a single set of music at the Yardbird, which was reprised in the second set of the evening. The audience was immediately taken by how the quartet was tilting Scottish and Irish, Japanese and mid-Eastern sounds to the rhythms of contemporary hard bop, all delivered in a very compelling and concise way. This group showed that once filled with meaning, the old pattern of melody-improvisation-melody still makes a lot of sense. While the Elias concert was preferred by middle aged couples and Smith by the bearded Edmonton jazz fans (no kidding), Montreal's L'Orkestre de Pas Perdus attracted a young crowd, some of whom got up and danced away to their infectious beats. This was the most funky ensemble I heard at the fest, a fact not so obvious due to its instrumentation (trombone, trumpet, alto, tenor and baritone saxes, tuba, drums, percussion), but both the lower winds, reeds and twin drummers really provided a groove for the dancers, and me tapping my foot away. Credit must be given to bandleader Claude St-Jean (tb) for all compositions and arrangements. My only problem here was the volume: This concert should have been staged in a much bigger venue than the Old Strathcona Performing Arts Center, which is a very friendly location, but not nearly as big as its name suggests. The oldest – and probably most durable – patrons of the festival went to see the Appleyard-Banks concert in droves. When Tommy Banks cracked a joke in front of his piano trio, referring to the 14 missing players rounding up his trio to a big band, everyone in the hall knew what he was talking about. With the local big-band glory days now behind him, time (as in time spent in the Senate) has not diminished in any way his hard-swinging piano playing. Banks, however, was only guesting, as it was really Peter Appleyard's show. The veteran musician took the stage, most of the time with his quartet, and a few guests joining in. He personifies so much of that joyful, happy jazz experience that younger attendees seem to miss a lot of the times. Not only did the 84-year-old display immaculate and elegant performances on vibes, jesting here and there on piano and drums, but also showed that he too is a match for Banks in terms of on-stage showmanship. Not that I was in search for a sharp contrast to the Botti-show, but had I looked for one, Médéric Collignon from France would have been it, for he was the complete antithesis to the slick American star. His quartet Jus de Bocse, presented to the audience of the Yardbird, was high-tension punk jazz at its best, without an idle minute during the set. Collignon played a full sized cornet on that night, he often plays a pocket version, too, an instrument I presume he prefers for the bending of tones and melodies. Collignon in my eyes is an artist par excellence, a jester, who also sings on occasion, at a pitch that must be close to the upper frequency border of human hearing. The audience of the Yardbird took a real liking to this hyperactive, electrifying and seriously entertaining musician. Also appearing at the Yardbird was trumpeter Terell Stafford and his quintet. But the group's opening number had me worried: The band launched into a Lee Morgan tune in a completely period manner. I was not at all keen on a late starter young lion group doing the music of their peers, but that was not the case, luckily. The smartly dressed band warmed up gradually in the hot surroundings (the Yardbird staff told me they would have full air-conditioning by next year). The Morgan composition was just supposed to loosen up the Billy Strayhorn material, to which their last CD is completely devoted. Orchestrated by the band's pianist, Bruce Barth, the standards associated to the Ellington canon sounded as contemporary as much as they should. Only Lush Life (a personal favourite) never took off in a paired-down piano-flugelhorn rendition. I decided to stay for the second set, to make sure I would head out like a die-hard Stafford-fan, having always respected him for his versatile recordings. Kudos to sax player Tim Warfield, he earned some good applause from me. This show probably best fulfilled the ideal of a grooving night at a jazz festival, with a straight-ahead hard bopping quintet, working on some well-known melodies. And yes, there were lots of blues. All those in attendance at the club, packed to capacity for both sets, were amazed because what they heard was just the way they expected it to be. Nothing wrong with that, and it was a kind of high resolution mainstream well presented and striking a nice balance, too. On the topic of trumpet players featured at the EIJF, I should not leave out a home-grown talent, Vince Mai, who was the sideman of the Phil Dwyer ensemble featuring Laila Biali. A frequent visitor to Edmonton, Dwyer orchestrated a program of Canadian singer-songwriter pop standards, commissionned by the CBC. These kinds of songs are a complete terra incognita for me, which somewhat lessened the appeal of the concert, but the featured guest was enchanting, her singing and piano playing a true novelty. By the way, she happens to have a program with the very same concept, also sponsored by the national radio. Otherwise the sextet did not go much further in its set than Herbie Hancock's New Standards project of yore, though the arrangements were colorful and thoughtful, the execution bordering on brilliant. Nevertheless I somehow had a suspicion that they have played this program for quite some time now. Maybe I had set my expectations a little too high as I was experiencing Dwyer live the first time. True, Dwyer is a great player with tremendous musical knowledge. But I could not help taking notice of each and every solo by trumpeter Mai, full of craftsmanship and shaped like little masterpieces. I will certainly stay on the lookout for Mai, too. 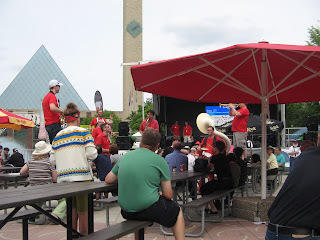 The Edmonton International Jazz Festival 2012 did a great job to justify one of its slogans: "There is a jazz for everyone", probably meaning to attract the largest possible crowds of the one-million strong metropolitan area. The living jazz tradition of the city was also well served by such aspects of the festival as the local big band performances and workshops relying on the first-rate jazz education of the city. This is not the festival to catch all the latest trends in music, but if you come with an open mind, it sure keeps your face smiling and your feet stomping. in the middle of Churchill Square, even dancing on the tables while playing their encore! Bàn làm việc văn phòng cho nhân viên thì phụ thuộc vào diện tích khá nhiều. Những chiếc bàn làm việc đơn có hộc sẽ được sử dụng cho những căn phòng rộng để giúp mỗi người có một khoảng làm việc riêng và cũng để văn phòng không bị trống trải. Tuy nhiên, ở những thiết kế nội thất văn phòng hiện đại đề cao tính gắn kết nên lại chọn những kiểu bàn làm việc văn phòng giá rẻlớn dạng đôi để tập trung từng nhóm nhân viên lại với nhau. Vách ngăn vẫn sẽ giúp mỗi người có những khoảng không gian riêng cho mình. Cho nên để có một văn phòng đẹp hiện đại các nhà quản lý cần phải chọn mua được sản phẩm nội thất văn phòng giá rẻ tphcm sao cho hài hòa với văn phòng cũng như là không gian làm việc tốt nhất. Chính vì thế các nhà thầu thiết kế cũng nên cân nhắc về việc tư vấn cho khách hàng của mình chọn được mẫu sản phẩm nội thất sử dụng tốt nhất.